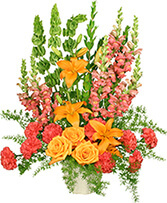 Product Code: 95428 Sincerest Sorrow - Peach, Orange and White Express your sorrow with a memorable tribute: our bright and beautiful arrangement of lilies, roses, bells of Ireland, snapdragons and more. Awash in soothing shades of peach, hot pink and orange, it's hand-crafted for the home or service. 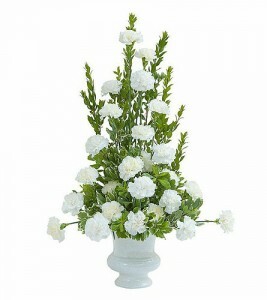 Lush white funeral flowers surround a beautiful Glass Cross in this stunning all white bouquet. 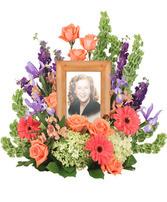 The Christian arrangement is appropriate to send to the home,church or funeral home as a heartfelt, religious statement of peace and divinity. 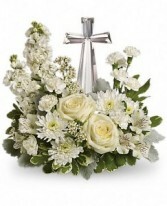 •A fragrant mix of pure white blooms - such as roses, alstroemeria, stock, carnations and waxflower - is accented with variegated pittosporum around an exclusive Glass Cross keepsake. •Approximately 14 1/2" W x 13 1/2" H •Components may vary.